The Nature Aquarium promotes aquatic plants to absorb nitrogen and phosphorus, which tends to become excessive and can lead to increased growth of algae, by supplementation with potassium and trace elements that easily become deficient in aquariums. This concept is according to Liebig‘s Law of the Minimum. ADA Brighty K is used as a liquid fertilizer to supply potassium while for supplementation of trace elements, Green Brighty STEP 1 to 3 are used for each stage of the aquarium. The basic combination of liquid fertilizers is ADA Brighty K and either one of ADA Green Brighty STEP 1, ADA Green Brighty STEP 2 or ADA Green Brighty STEP 3. 1. 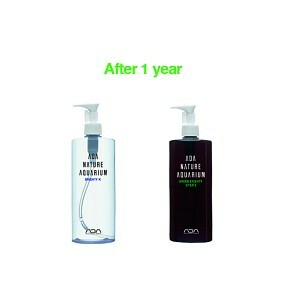 ADA Green Brighty STEP 1 + ADA Brighty K: Contains well-balanced trace elements. Promotes production of new leaves. 2. ADA Green Brighty STEP 2 + ADA Brighty K: Contains more iron required for growing plants. Maintains rich leaf colors. 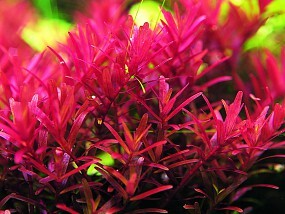 Apply ADA Brighty K to an aquarium first and let it spread by water flow. ADA Brighty K, specifically formulated for potassium supplementation, is basically used in combination with other liquid fertilizer. However, it must not be mixed or applied together with any other liquid fertilizer to avoid cloudy aquarium water as a result of chemical reaction. You should apply ADA Brighty K to your aquarium and let it spread over by the water flow first, and then apply other liquid fertilizers. 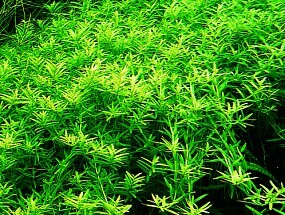 ADA Green Brighty Special LIGHTS has beneficial effects on aquariums with sun-loving aquatic plants, such as stem plants and Riccia fluitans, which grow fast and actively absorb nutrients. Aquariums with a lot of sun-loving plants sometimes have a problem of lacking nitrogen or phosphorus, which are hardly in short supply in ordinary aquariums, resulting in faded leaf colors of aquatic plants. ADA Green Brighty Special LIGHTS, a perfect liquid fertilizer containing nitrogen, phosphorus, potassium and trace elements, helps to improve the leaf colors of sun plants and promotes their growth. 1. ADA Green Brighty Special LIGHTS is specifically formulated for sun-loving aquatic plants. 2. Application of ADA Green Brighty Special LIGHTS helps to enhance the leaf colors of stem plants and other sun-loving plants. Aquatic plants vigorously absorb nutrients during active photosynthesis. Ideally, liquid fertilizers should be applied slowly at all times in line with the rate of nutrients absorption by aquatic plants, but this is impractical. 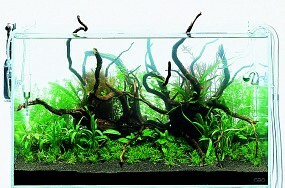 Usually, a day’s supply of liquid fertilizers is added to the aquarium when the lighting is turned on every morning. This is a particularly effective timing, as ADA Brighty K has an effect of promoting plants’ photosynthesis. ADA liquid fertilizers have a dispenser pump. With this pump, daily application of fertilizers is made easy at the dosage predetermined according to the tank size and lushness of aquatic plants. Aquatic plants actively take up nutrients through the surface of their leaves spread in water. 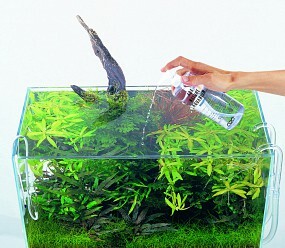 It is therefore effective to add liquid fertilizers and additives to an aquarium for healthy growth of aquatic plants. Liquid fertilizers and additives primarily supply potassium and trace elements which can easily become deficient if the aquarium is dependent solely on nutrients leached from the substrate and fish feces. Liquid fertilizer also helps improving the leaf color of aquatic plants. 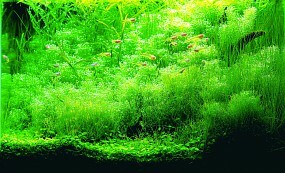 ADA Green Gain and ADA ECA are additives to encourage healthy growth of aquatic plants. ADA Green Gain contains botanical hormones to accelerate the production of new leaves. It is therefore very effective to apply this additive immediately after pruning, helping to stimulate rapid production of new leaves for optimal results. ADA ECA contains iron in a form that is easily absorbable by aquatic plants and helps improve the color-intensity of red stem plants. The use of this additive is effective particularly when red stem plants are pale even with daily application of liquid fertilizers. 1. ADA Green Gain is good for newly pruned stem plants. 2. 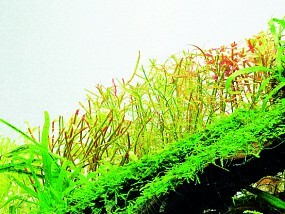 Red stem plants look more vivid after ADA ECA is added to aquarium. 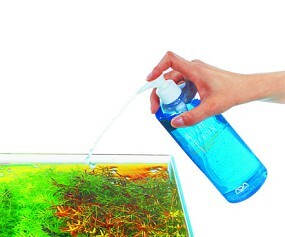 Liquid fertilizers are directly added to aquarium water and absorbed by aquatic plants through the leaf surface. Therefore, the effect of fertilizer is not fully achieved if they are added to aquariums when aquatic plants do not grow submersed leaves yet. Since aquatic plants absorb very little nutrients immediately after planted, application of liquid fertilizers should be commenced approximately one week after planting when aquatic plants start growing new leaves. Application of fertilizers should start approximately one week after the aquatic plants are planted.